"During the Miocene epoch, around 15.5 million years ago, the region was lush and wet, home to many plant species now extinct. A number of these trees were buried in volcanic ash, and the organic matter in the tree trunks was gradually replaced by minerals in the groundwater; the resulting petrified wood was protected for millennia by flows of basalt. Near the end of the last ice age, the catastrophic Missoula Floods (about 15,000 BC) eroded the basalt, exposing some of the petrified wood. In prehistoric times, the Wanapum tribe of Native Americans inhabited the region along the Columbia River from the Beverly Gap to the Snake River. 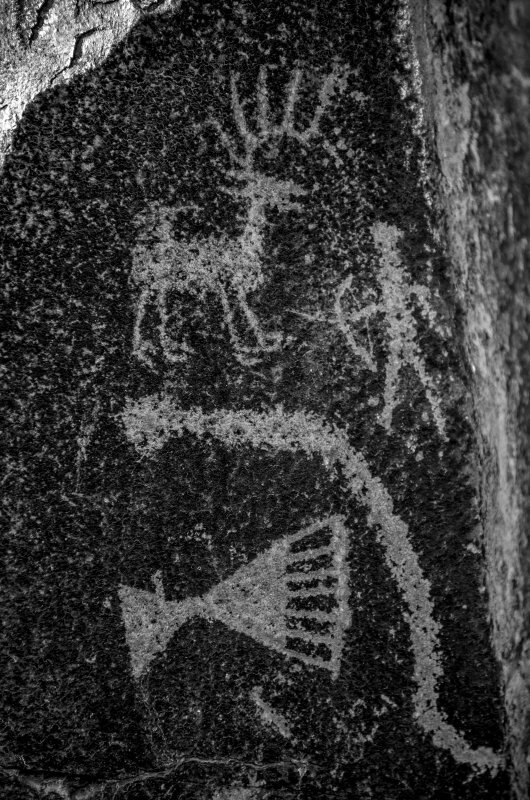 The Wanapum people first welcomed white strangers in the area during Lewis and Clarks expeditions across the United States.They lived by fishing and agriculture, carved over 300 petroglyphs into the basalt cliffs, and may have used the petrified wood exposed by erosion for arrowheads and other tools." Below are some of the rock carvings made by Native Americans and the actual animals depicted in the petroglyphs. These bighorn sheep were grazing near the museum. 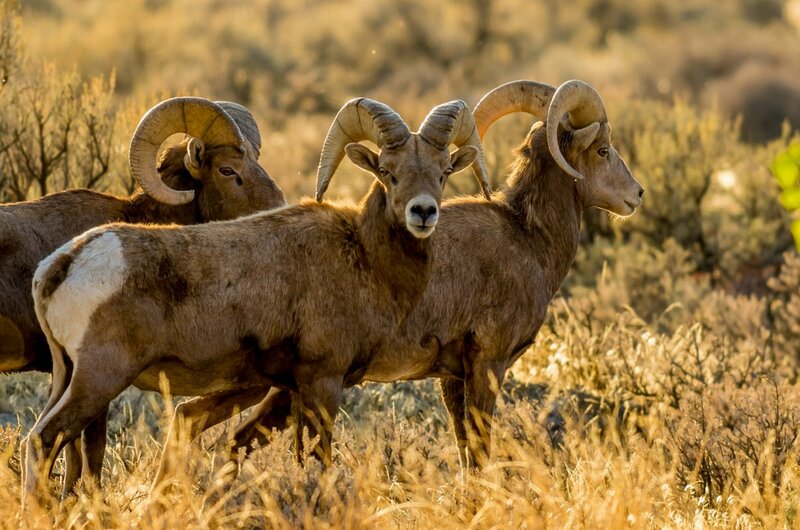 That is a healthy looking group of big horns. Thanks for posting the pics and the info. Nice images. I am interested in rock art and prehistory in general. 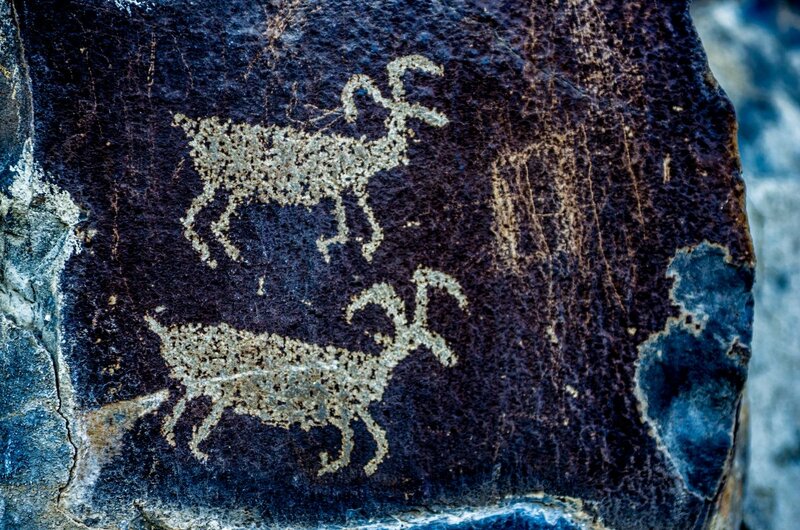 But I particularly like the fact that the second rock engraving is of big horn sheep and you got an image of them in the area today. That third image is great - good colour and bokeh that picks them out from the background. A story told in this series of shots.